Kaing Guek Eav, alias Duch, gestures in the Extraordinary Chambers in the Courts of Cambodia on the outskirts of Phnom Penh, March 29, 2011. The prosecution at Tuesday’s appeal hearing for Comrade Duch, the former head of the Khmer Rouge's notorious S-21 prison, has asked the United Nations-backed war crimes tribunal to increase the jail term it handed down last year. 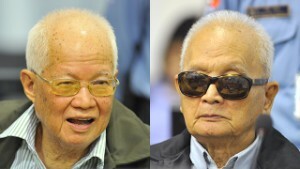 March 29 marked day two of the scheduled three-day appeal court hearing for Comrade Duch, the Khmer Rouge’s former chief jailer, who has asked to be acquitted and released. Last year, the United Nations-backed tribunal sentenced Duch to 35 years in prison but reduced the term to 19 years because of time served and other factors. The lower court had found Duch responsible for the deaths of more than 12,000 detainees at S-21 prison, which he headed between 1976 and 1979.